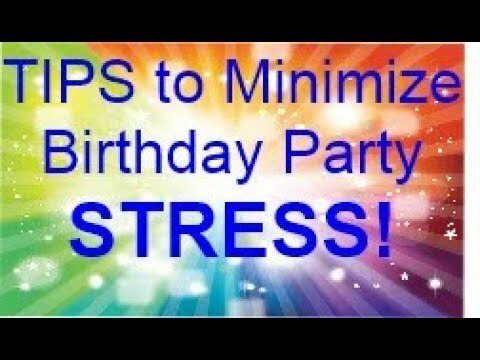 Tips to minimize party stress. 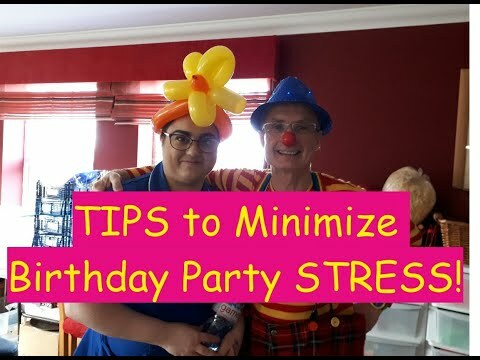 TIPS to Minimize Birthday Party STRESS! Do I Need An Entertainer & A Hall? Do I Need An Entertainer? If you want to save yourself a lot of stress and hassle then YES. Many children have a professional entertainer of some kind at their party. Makcoe sure you book one early, as the good ones are often in high demand, and can be booked up months in advance. Book the entertainer before the hall as other venues can be found – ask Mr Custard he knows lots of places. Do I Need a Hall? If you have a good sized room in your house that can comfortably fit the number of children you’re inviting then usually this is absolutely fine. Having a hall avoids the mess in your house and usually has better parking. Many parents have parties in their own homes and they are a roaring success but if you have a lot of children coming, then a hall would be better. If you are hiring a hall then book as early as possible, as popular halls can get booked up very quickly. Why not use Mr Custard’s venue finder or visit his blog to help you? If you are really stuck contact Mr Custard by email or Facebook and he will do the work for you for FREE. It would be helpful if Mr Custard can set up with a table close to a mains power supply. He will advise you on the best place for him to set up when he arrives, but if you have a specific place you’d like him to set up please make sure he can access a power socket. Most venues will supply a table that he can use. If power really is a problem, Mr Custard has the ability to run without power for a short time. Lots of parents will want to stay to the party. It’s a great chance to catch up with one another, and enjoy the fun. To give your children the best show possible, we do advise you avoid the noise of parents chatting in the background preventing the children from hearing the show. Unfortunately this can prevent the children hearing & enjoying the party. We realise there is only so much anyone can do to control this, so feel free to discuss options from our years of experience. Where possible, encourage parents to keep noise levels to a minimum. We can’t advise strongly enough how important it is to keep the room free from distractions, whilst your party is taking place e.g. toys, loose balloons on the floor, bouncy castle, open buffet for kids to graze, garden toys/equipment (if the party is outside). We recommend keeping balloons to one side – use them as a fun extra when Mr Custard has gone – even keep them in a double duvet in another place – easy peasy! If you have a bouncy castle, then we’d simply ask you to please deflate it during the magic show. If you have balloons you want to use for decorations, simply fix them somewhere visible, but out of children’s reach. With an open buffet, then we’d advise covering the food up so children know the food is for later. This just helps maximise the children’s enjoyment during the show. When To Plan A Party? We always recommend that customers contact Mr Custard BEFORE booking your venue. He will happily give you 24 hours grace before processing the booking form and issuing a paypal invoice. The earlier the better! Parents can take a very long time to R.S.V.P. – if at all – so be prepared for that. Four Weeks before avoids weekend clashes with other parties or events. Always ask for an RSVP on the invitations. Follow up the invites a week or two later, by speaking to parents at school or calling them before the day so you can finalise numbers. When planning food and drink, or party bags, always plan for a few more expected guests, it’s always better to over cater than under cater, as sometimes some parents end up bringing siblings too. Should I invite the whole class? Mr Custard likes to put this question another way. If you were holding a party would you invite everyone at your place of work, club and society? Ask the birthday child what they want instead of second guessing; after all it’s THEIR special day. Try as we might we can’t always help a personality clash. What Food Should I Serve? – Should the Parents Stay or Go? No celebration can be without sweets, crisps and all the chocolate goodies that kids love. It’s a good idea to have a variety of fruit and vegetables too. Mini raisin boxes go down well, as do carrot and cucumber sticks or cherry tomatoes. Mixed fruit such as strawberry’s or pineapple chunks are popular as well. Not forgetting a mixture of sandwiches and fruit juices. Should The Parents Stay or Go? If the children are three or under it’s important that the parents stay. With ages four or over, unless they are extremely shy, they will just be interested in having fun and joining in without Mum or Dad being there. So unless you want to have a separate social gathering with parents while the kids are entertained, it’s probably best that they go. Also it’s worth knowing that if parents stay and are talking in the background it can make a fair amount of background noise that can make it harder for the children to hear the entertainer during the show. If parents do stay and you are having a parent gathering as well then its best if this takes place in a separate room or it can disturb the main entertainment for the children. Do I Need Party Bags? Right or wrong, the children will probably expect something to go home with. It’s almost an expected feature of birthday parties now. You can always opt for something else like a gift wrapped item for each child, or a small toy, a mini book, together with a piece of cake, so long as they all have something to take home with them at the end of the party. There are loads to choose from. Girls love items such as bracelets, hair bobbles, fairy wands, sunglasses, and stickers. For boys they’re a big fan of sticky wall crawlers, bouncy balls, water pistols or stickers. It’s best to go for a few quality items rather than lots of little cheap nasty things that they won’t like and won’t last. We provide party bags should you need them. Kids come up to us at the end of the party proudly showing us what they’ve got in their bags, so we know we’ve got it right. Now you have all the ingredients for a great Party! Good Luck and don’t forget to get out of the kitchen & watch your child laughing with Mr Custard. Please don’t hesitate to ring & ask for our advice it’s FREE!